Welcome to the Hebridean Island Cruises North America website! Call 877-600-2648 to book your cruise today! Welcome to the Hebridean Island Cruises North American website! Here you will find updated itineraries, cruise logs, pictures, offers, and all the information you need to start your journey on board Hebridean Island Cruises. As you may know, Hebridean Island Cruises is one of the best small ship cruise lines offering luxury cruises around the Islands of Scotland, Northern Ireland, and The Isle of Man on a unique ship, the Hebridean Princess. This one of a kind all-inclusive cruise is carefully planned by our own highly experienced researchers, whose brief is to capture the cultural essence and historical significance of each port of call. Our Scottish Island cruises won’t disappoint you! 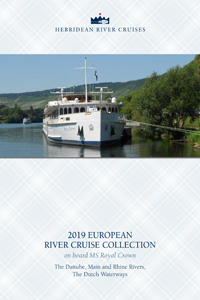 Looking for European River Cruises? On board Hebridean's Royal Crown you can sail into the very heart of iconic towns and romantic cities and explore the rich history and colorful centers this part of the world has to offer. Ready to start your search for a 2019 cruise with Hebridean Island Cruises?